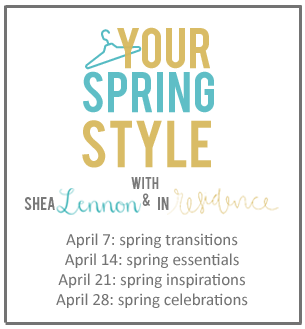 Every Tuesday in April, Anne and I are hosting a spring style link up. 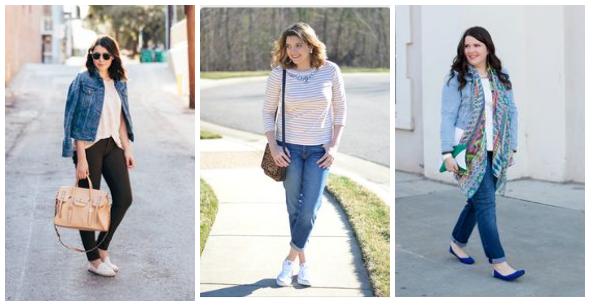 We would love for you to follow along and link up a spring look! Today's Your Spring Style is all about what's inspiring you for spring. My Spring 2015 Inspiration Pinterest board is where I've been storing that inspiration. When I look at my board as a whole, three major themes stand out. Pale pink is big right now, and I'm loving it. I used to fear that it would wash me out, but I've grown more accepting of my pale skin over the years, and now I think the soft pink complements it nicely. Pale pink can be too sweet, however, if it's paired with too many other pastels and girly elements. I'm drawn to looks that mix it with a little edge, like snakeskin print and ripped up jeans. Jean jacket, white jeans, boyfriend jeans, chambray shirt... it's safe to say I have a healthy obsession with denim. This spring I'm in the mood to make denim look light and fresh by pairing it with bright colors, patterns, and crisp white accents. Here's my interpretation of the Pale Pink + Edge inspiration. What's inspiring you this spring? We would love for you to link up an inspired look below! Be sure to link back to me or Anne (In Residence) so we can share the love. Also linking up to Pastel Me at the Creative Closet. 5 years ago: wearing yellow and olive with nautical touches. 4 years ago: I had pale pink and black on my mind then too. 1 year ago: celebrating Easter with navy blue print and the cutest accessory. I love these spring looks! You look so cute in your pink cardigan! Thanks Elle! I totally hear you, and that's awesome that you've made strides in doing things alone! I'm also a total introvert--WAY out of my comfort zone to go to conferences, events and the like. But I'm also trying to get better at it! What a pretty and feminine look! I love the pink and lace paired iwth the edgier shoes! I'm the same way, even with fun stuff if I have too many things going on, it kind of takes the fun out of it--I need time to BREATHE on the weekends! Thanks Lydia! I've been drawn to pastels as well--something about spring I guess! Yes to all of it - pale pink, stripes and denim! I would probably add mint to my list, I love wearing a lot of mint in the spring! Thanks Beth! I totally agree--I'm loving mint right now too (in fact I'm wearing a mint cardi today!). This is such a pretty and feminine look. I love how you mix the lace with the snake print shoes. Oh, and the hair--looks perfect. That lace top is genius! You look so great! Pale pink and grey is such a pretty combo! Love this look! Thanks Danielle!! I can't get enough of pale pink right now! Adorable outfit! I, also, love pale pink, stripes, and denim. Pink has always been my favorite color, but since it is big now, it is even more so my favorite! As I was reading your post I was thinking about how much I liked combining gray with light pink and then saw that you had done that with this look! And you're totally right that our outfits (mine from my 10 things first week wrap up) look similar...didn't even realize that animal print was a good way to edge up the color but you're totally right! Great look! Hey thanks Jess!! I loved your animal print/pale pink combo too--I think it does add just the right amount of edge to toughen up the pink a little. Thanks Alexandra! I can't get enough of it right now either :) And I love a good contrast, so girly + edgy is perfect for that right now! Haha I've become more accepting of my pale skin too (slightly). I love pale pink. And stripes and denim. Great post! Ha, it's taken me years to accept it, but the fact is even if I spend time on the beach (which I don't) I'm not getting much more tan! Oh well. Thanks Gina!! i LOVE that pale pink. i need more of that in my life! Score! I love finding great "forgotten" pieces.